The Madhya Pradesh Congress Committee celebrated the Ganapati festival at its Shivaji Nagar office, for the fourth consecutive year, leaving the state BJP leaders worried. 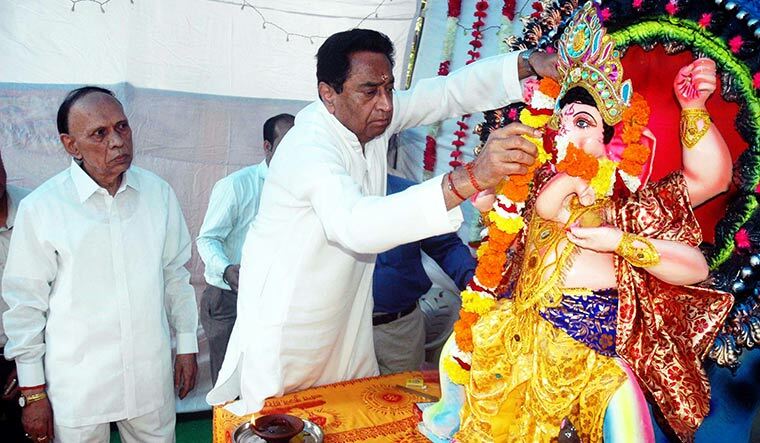 These days, state Congress president Kamal Nath prays before the Ganesha idol on the premises, every day, before entering the three-storey party building. 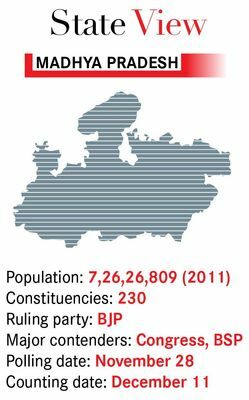 The Congress, which has been out of power in Madhya Pradesh for 15 years, has suffered because the Rashtriya Swayamsevak Sangh and its affiliate organisations have consolidated Hindu votes statewide. The BJP had even cut into the Adivasi votes, which used to be a strong base for the Congress. After the Congress’s embarrassing defeat in the 2013 assembly polls and 2014 Lok Sabha polls, the party leaders attributed “polarisation of votes on religious lines” to be the main cause of defeat. In the 230-member assembly, the Congress got just 58 seats, while just two members—Kamal Nath and Jyotiraditya Scindia—won Lok Sabha seats. Reaching out: Kamal Nath garlands the Ganapati idol at the party office in Bhopal. Immediately after the 2013 defeat, then Congress state president Arun Yadav asked all state leaders to diffuse anti-Hindu sentiments built around the party. “I asked my workers to attend all Hindu religious functions in their areas and defeat the BJP at their own game,” said Yadav. 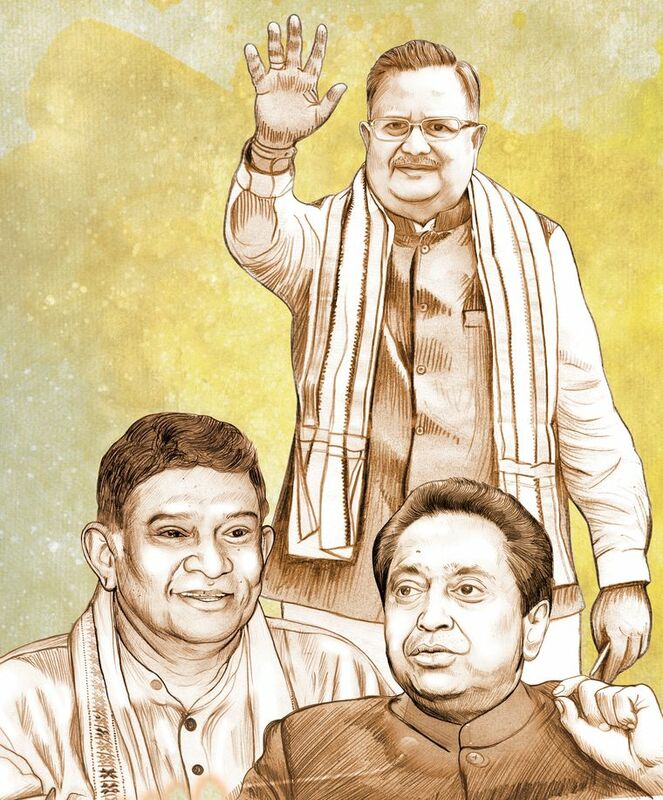 Five months ago, Arun Yadav was replaced by Kamal Nath, who continued the same approach. To send a message to the state electorate, he started his innings by visiting three prominent temples in different regions of the state. Earlier, to counter BJP claims that the Congress is an anti-Hindu party, Nath got a 101ft Hanuman idol set up in Chhindwara. “The BJP has nothing to do with religion; they simply want to exploit sentiments,” said Nath. 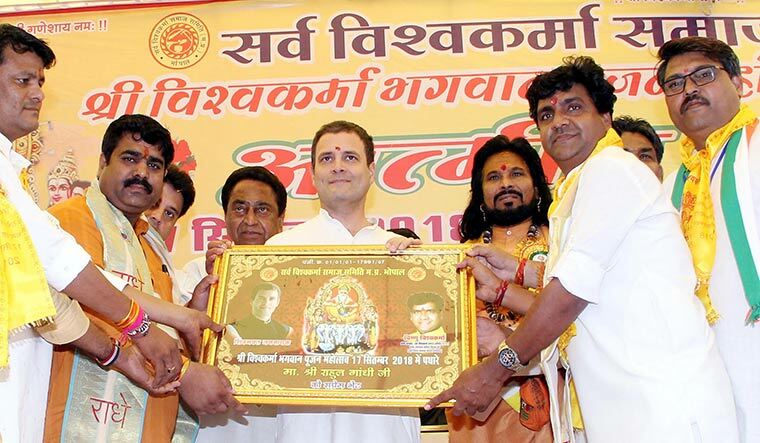 Community card: Rahul Gandhi being felicitated by members of the Vishwakarma community during his roadshow. Nath has unfolded an agenda to win back voters who were angry with the Congress’s alleged minority appeasement. Realising the prominence of religion and symbols associated with it in state politics, he even announced that his party will set-up gaushalas (cow shelters) in every panchayat if the Congress comes to power. In 2010, Chief Minister Shivraj Singh Chouhan, on the suggestion of the RSS, announced that they would trace the mythological route taken by Lord Ram, when he was on exile in Chitrakoot. However, the promise could not be fulfilled. The Congress recently undertook a Ram Path Yatra from Chitrakoot to remind the BJP of its promise. Former All India Mahila Congress president Shobha Ojha, said, “If we are voted to power, we will develop Madhya Pradesh as an international religious tourism hub. We will prepare a roadmap to restore ancient temples and monuments to attract more tourists.” Ojha said that the BJP had neglected some of the biggest centers of Hindu pilgrimage in the state. The Congress has realised that if it wants to defeat BJP in the assembly elections this year, it has to play the same game. Both Nath and Scindia regularly visit temples. Scindia, who hails from the erstwhile ruling family of Gwalior, always takes part in the procession of Lord Mahakal in Ujjain. Moreover, every year, Arun Yadav takes part in the three-day-long Chunri Yatra at Omkareshwar. When Rahul Gandhi reached Bhopal on September 17, to formally launch his party’s poll campaign, enthusiastic party workers put up hoardings as usual. The most talked-about one welcomed the party chief as “Shiva-bhakt Rahul Gandhi”. Gandhi did not disappoint party workers. He started his road show in Bhopal only after offering prayers at a temple and performing puja led by 11 Brahmin priests. Feeling the heat of the Congress’s soft hindutva, the BJP has announced a slew of measures. Apart from sanctioning Rs100 crore towards developing the Ramayan circuit in Chitrakoot—against their old promise of developing a Ram Gaman Path—Chouhan declared the formation of a special cow ministry. He even appointed a minister in charge of cows, in response to Nath’s promise to build cow shelters at the village level.